More and more, little indications of spring are sneaking into our days. A little crocus bloom here, a daffodil there... and my mother is disappearing into her greenhouse. During planting season she says "When evening comes I can't wait to fall asleep so I can start planting again tomorrow!" I'm so glad her favorite season is here. Spring is in my heart too. I want to celebrate this effervescence with something delicate and light from my kitchen. 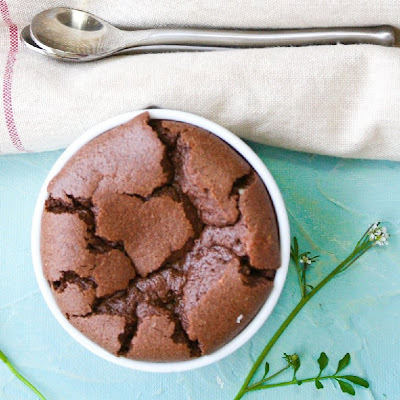 Within 20 minutes I had these unfussy, light-as-air chocolate souffles at the ready. And boy, are they ever yummy! This recipe is from one of my favorite cookbooks. I've had it for a several years and I always turn to it when I want to be inspired by fresh, vibrant, better-for-you foods. It's the New Mayo Clinic Cookbook. I like that it points you in a healthier direction without hitting you over the head with "you can't do this-or-that." This recipe makes one large souffle or 6 small ones. 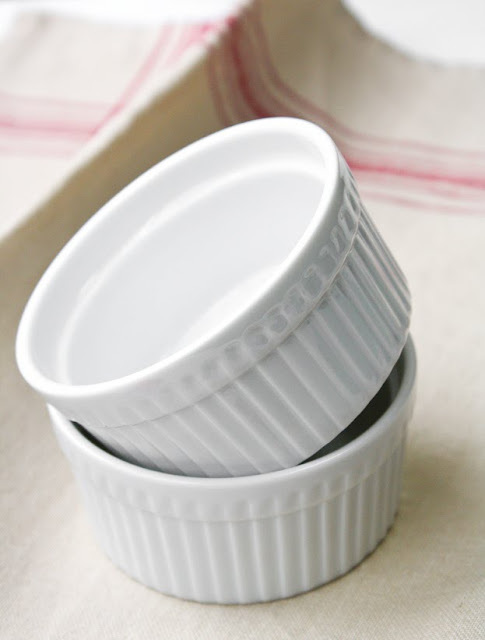 I like desserts in single servings, so used 6 - 1 cup ramekins. There are only 3 tablespoons of flour in this recipe, and one tablespoon of nut flour. I used ground almonds but hazelnuts can also be used. 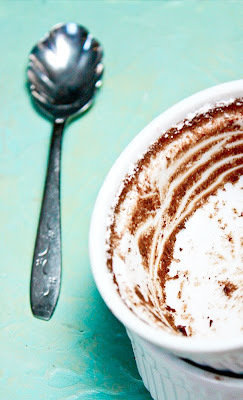 Just a pinch of cinnamon really amplifies the chocolate flavor. You won't even know it's in there. The first part of this recipe is much like a pudding. 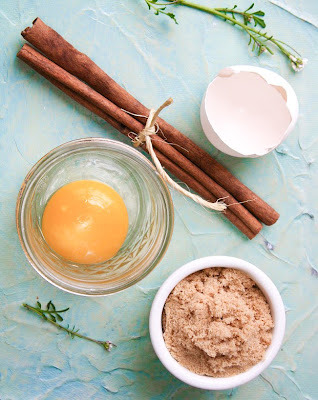 You cook almost all of the ingredients (except the egg whites) together on the stove top. Expect these to fall a little. They were so tall when first taken out of the oven! Recipe from "The New Mayo Clinic Cookbook". 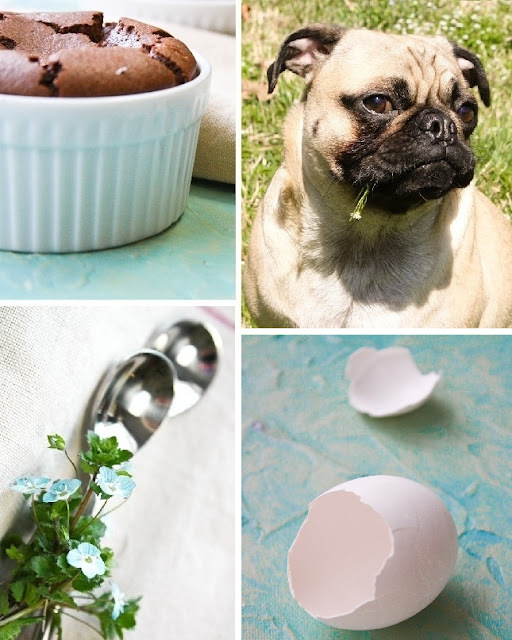 See Light and Springy Chocolate Souffles on Key Ingredient. This is one of my favorite recipes. The raspberries are a nice pairing, although I must admit that I did not buy mine fresh. I really wanted delicious fresh raspberries, but at my geographical location they just aren't what they should be at this time of year. (too sour!) I bought a can of whole raspberries and drained them in a sieve before garnishing the souffles. We sure enjoyed them. I hope you do too! YUM! 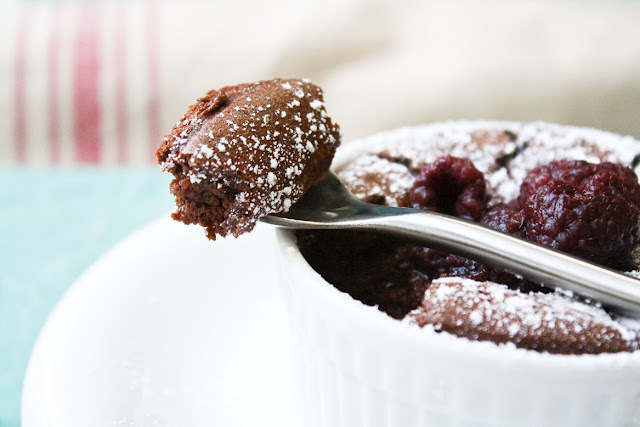 I've never had chocolate souffle before but these look delicious! I may just have to try baking some soon. I loved your post! You make me want both Spring to hurry and a one of your souffles. Loved the pictures! Oh, this looks so good!! and healthier for you!! I can't wait to make them! These look amazing and I love how they look in the little cups. We have fresh strawberries right now, I just might have to try this!! O.K., you talked me into it...I AM going to make these this weekend!! Those overhead shots...Oh my! I love the delicate cracks on the top. I cannot believe it only look 20 minutes to whip this up. Enjoy your spring! We're heading into Autumn here! Hey Heather! I have an award I want to share with you. Stop by my blog when you get a chance! 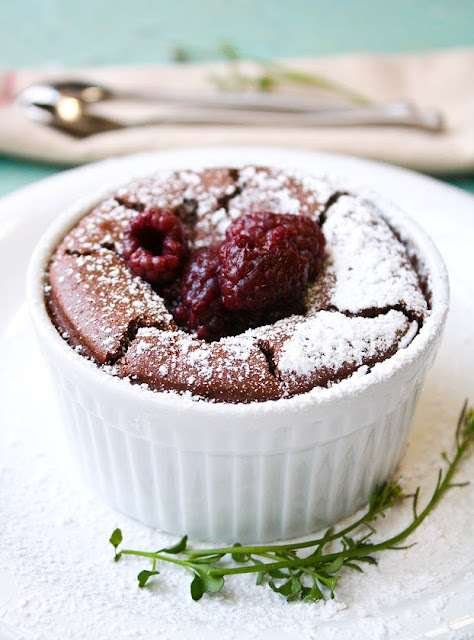 The chocolate souffle looks unbelievable! Your photos are beautiful. 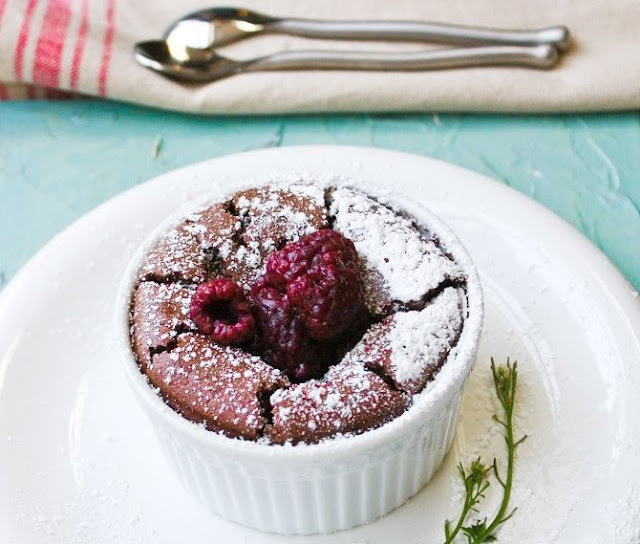 This chocolate souffle looks utterly gorgeous, this post definitely has me craving some right now! Souffles scare me, so I'm truly impressed. It looks perfect! I'm all for healthy and delicious. Great clicks. These are completely drool-worthy (running to grab a napkin hehe 8p). I only had my first dessert souffle about a year ago and have been dying to make my own ever since. Utterly gorgeous Heather ... very pretty & delicious indeed! Oh, those look delicious...and so pretty! I will one day try my hand at souffles. Eeks. The thought of it scares me but these look so good I'll have to try em! Also, is that the sweetest pug or what! adorable. 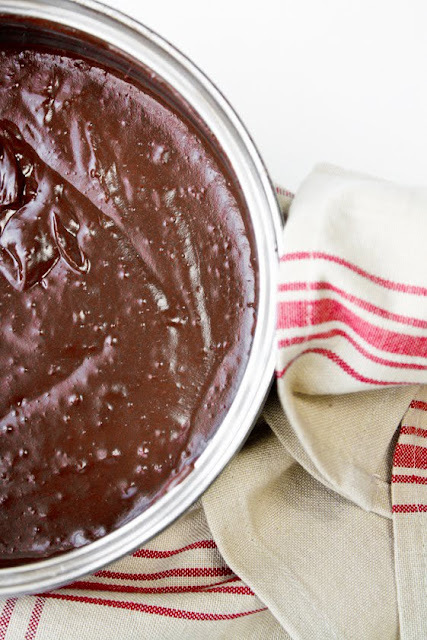 I love chocolate suffles, I found this recipe as a wonder, because I have been searching this for years, I know that I am going to make it at home as soon as I can.